Hey there everyone and Happy Blogoversary week! January 21st marked the 4 year mark for 25 Sweetpeas and the started the fifth year of blogging. I have been contemplating about this post for a few weeks and nothing exciting or fun came to mind. Especially considering I just sort of had a "Throwback" post up at the start of the year as my 2018 Year in Review, and that's the style of post I always think of on a big anniversary. So instead of doing that I have decided to write my "How I started Blogging". My process/order of which I did things, and just have a fun little chat about it all. Now before we get too deep into this post lets just preface this with, this isn't a How to Start Blogging post. Ha! 😂 I do actually want to do that this year though! I've contemplated it for so long and just want to do it, so if that is something you want to see let me know! :) Anywhooo lets see how 25 Sweetpeas started. So what you are currently on, 25 Sweetpeas the blog, started in 2015! However 25 Sweetpeas was first an Instagram Handle with some underscores in it and that started in August of 2012, so if you want to get really technical I suppose you could say 25 Sweetpeas has been around for 7 years! Woah, that means I've been doing nail art for 7 years, which is a long time actually! I don't think I even realized its been that long until just now, thats crazy! So really I guess I should technically count that as my start, so lets start there! As 2013 began I had received quite the fun amount of nail polish from Christmas so I started to play with it all more and do my nails more. According to my Instagram from 2013 everything I posted consisted of; weird graphics I edited on an app, nail art, Florida trips, Coffee, and music. In the fall of 2013 I had long nails and become more adventurous nail art wise. Doing nails inspired by the famous Christmas season red cup, attempting sweater nails and more. However I still wasn't posting all nails, probably 2 or so manis a week. That Christmas I got acrylic paints and that changed the world of nail art for me. I was a super snowy winter/Christmas break that actually was extended because of snow storms so I played around a lot with nail art. 2014 began and we were still snowed in and I started posting nail art a lot more by doing a ABC Nail art Challenge. I actually remember this time so clearly. I was just getting really into the nail art and spending way more time on it. That February we went on a trip and I specially planned nail art ahead of time so I would have something to post. Ha! The first part of 2014 the nails were very sporadic because of school and we were in the process of moving, and then that spring is also when we got Dixie! Summer is when the nail art got serious! I think basically every other day I was doing nail art and posting on IG. I was really just happy with nail art and life that summer. :) And that kept going through Fall and winter that year. Christmas Nail Art that year got intense. I was doing more detailed nails art than ever before, and one of my manis made it into Nail It Magazine. So over that Holiday break I basically decided I wanted this to be more. 2015 starts and that first month I start the blog! I'd always wanted to have a website for some reason. I mean originally I think I thought I would be writing music reviews or something but once I figured out nail blogging was a thing, I had to try. Granted it took a lot of research and decision making but once I did 25 Sweetpeas became more of a thing. :) I started blogging every other day if not everyday. I was also doing school and one of the most stressful years might I add. But it was the year where I took nail art more seriously, and even got the opportunity to swatch/review for a few brands. That fall I blogged I think daily, and I started Youtube but at this point the videos were just those ones I posted on IG that were only a few seconds long. LOL! 2015 was also the year I got to design and release my first ever polish with Takko Lacquer. That was so unbelievable. 2016 was full force daily blogging and now I can't imagine doing that now. I think when you look at how many blog posts went up that year it actually exceed "daily" Ha! That year was such a great one for nail art. Plus I started swatching a lot more towards the end for sure. Thats also one of the reasons there were so many posts, each polish had its own blog post. 2017 was the year where I wanted to do more. I wanted to create more informative blog posts, and more things beyond nails. I feel like that didn't really happen but I did branch out in my photos. Flatlays become something I really wanted to do so I tried to do more. 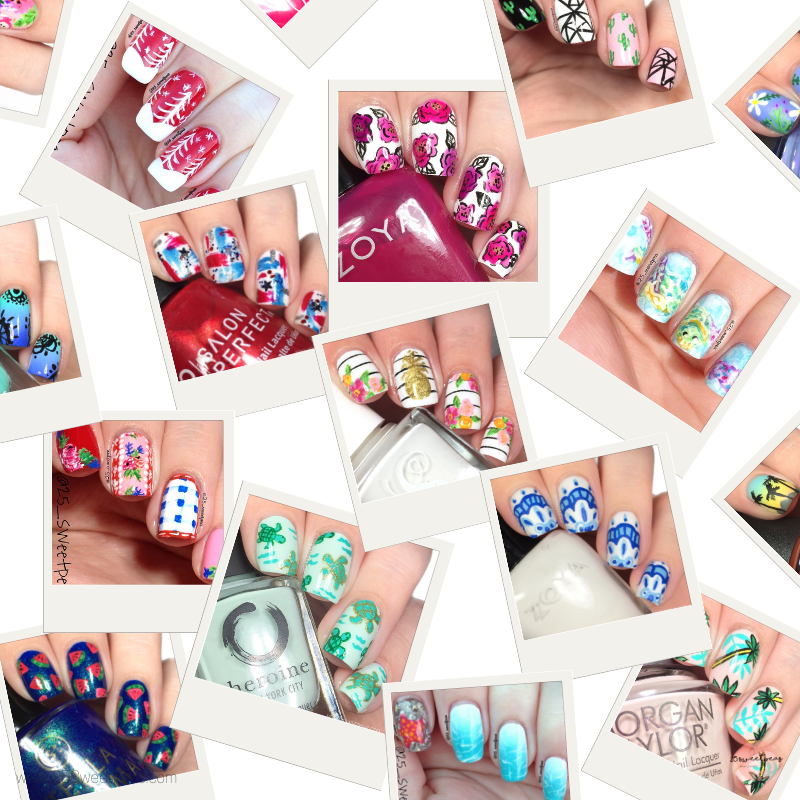 In this year I also joined the Digital Dozen and did weekly nail art with a group of friends. I also started swatch videos this year. I wasn't doing a ton of them but I was slowing trying to figure out how to do Youtube. I worked with some amazing brands, and that summer I changed my style IG wise and blog wise. I wanted to create with I had always envisioned in my head so I just figured it out. I switched to my ideal white aesthetic background, with lots of pops of color, and things beyond nails. It was so fun, I was getting to put in more personality into my blog posts and I was just loving it. Enter 2018 and wow! I stepped everything up. I started to do more detailed informative blog posts, tried to achieve better photos and better art. Plus I started doing Youtube on a weekly basis, 3 videos a week. I also even started to be in front of the camera which is something I NEVER envisioned myself doing but I did, and now do! :) Summer of 2018 I feel like was the first time I was 100% happy with everything though. Plus I finally felt (still do) that my blog was actually just right and was content with its layout. In 2018 I got new tech to work more efficiently with and new software for videos, and it was game changing. I started a new style of art and sharing with it you guys as well as just being more me on the internet in general and I think thats been a game changer, plus videos. I love doing them and I didn't know that until 2018 which is a pretty big thing! I also remanded at the end of 2018 and designed it 100% all myself this time which is just so neat! In the past so many years of blogging I have been able to do so many amazing neat things that if I listed them all I would be here for a very long time, and you would be so tired of me for typing so much! :) Really though its all possible because of you guys, for any time you stop by and read, or watch a video. Anytime you chat with me on Instagram. Like, comment, or share a post of mine its what's gotten me here and I know it sounds super cliché but really I am so thankful for your support though all of my crazy different adventures on here. :) It wouldn't be possible with out you! Well that is it for today! Its been a long chatty post so I best be going! What a fun post! It's awesome to hear how you got into this crazy world of ours!